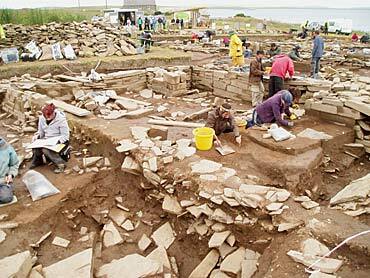 The growing importance of the Ness as an archaeological site of international significance has come the inevitable international media attention. In lots of ways this is very welcome. Many of the hundreds of visitors have heard of the site through their national media and it is clear that many visit solely because their interest has been fired by printed news and features, television programmes and, increasingly, by social media and websites. Today brought even more media visitors. A German film crew making a programme about Scotland decided to cross the Peatland Firth to visit Orkney and the Ness. Dain reveals more of the entrance to Structure Twelve. As their film is so wide-ranging, we suspect that the Ness will only merit a snippet or two in the finished product, but all interest is welcome – even though the sight of an umbrella, held up by a crew member, was seen by many as curious (umbrellas not normally being the shelter of choice in windy Orkney). We are also glad to welcome Jim Richardson and Jim Turner, who are taking photographs for National Geographic magazine. An article for that magazine, with its massive circulation, has been planned for a couple of years and magazine writer Roff Smith has become a good friend of the Ness. He has visited (on his bicycle) on several occasions and has even sent his daughter Laura, who is digging with us this year. We hope to see Roff again in the next few weeks and an article in the magazine, perhaps at the end of this year or during next year. In Structure Ten, the overall phasing has progressed well, but it is now necessary to address the fact that certain features, including the “dressers” and the north-west pier, are later elements – facts that are hindering further understanding of how the structure developed and was used. They will have to go, but this is not the dangerously radical notion it may appear to the uninitiated. The simple fact is that archaeology is necessarily a destructive procedure because it is often imperative to remove an element in order to see and understand what is underneath it, and what has gone on before. Hugo and Felicia contemplate the rubble fill of the new end recess in Structure Fourteen. Anything which is removed is, of course, is thoroughly documented beforehand by drawing, photography and by three-dimensional fixing. Gone, but never forgotten, and always capable of being recalled digitally. This, however, is still not a decision taken lightly as these elements are such a piece of the furniture in Structure Ten and have become almost old friends that have helped to define this amazing building. Hugo, Jim and their team have continued to reveal more in the extension of Structure Fourteen and Felicia, who has been in an end cell in the south-west area of the structure, has revealed how neatly the cell was filled in by the rubble material. In Structure Twelve, the removal of the baulks left to define the area of the robbing trench will allow the last remaining midden to be taken down in a level manner. 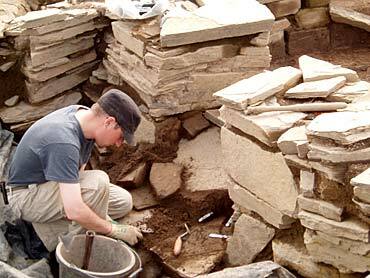 In the northern entrance into the structure, Dain has been removing the blocking material, allowing this to be taken down to the same level as the interior, thus allowing the midden over the whole structure to be taken down in a clear stratigraphic sequence. 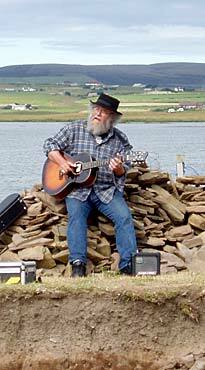 Classic blues musician Walker Ryan concludes a perfect day on the Ness. To end an almost perfect day, we had an almost surreal experience on site. Walker Ryan, an exceptional blues musician from Oregon, had visited the site last year and promised to return this summer armed with his guitar which he has duly done. As the close of play on site neared we were “serenaded” by the haunting rhythms of some real blues classics, including Robert Johnson. 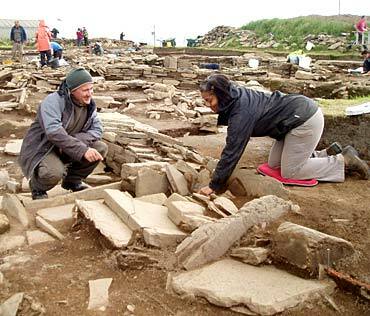 As the music resonated around the site, one felt that music was not alien to the site and our Neolithic forefathers must have incorporated sounds in their activities at the Ness (perhaps not the Blues though!). A big thank you Walker from all the team – made our day (especially Nick’s). Rain is promised for tomorrow. We’ll see. Hello and welcome to Tuesday, July 31. Another day of good weather, a few patches of sunshine and a light wind. My name is Catherine and I have worked in Structure One for the last week. For the past two days, I have worked in the north-western recess, taking down the levels gradually, to try and reach occupation level. There are two contexts revealed. Today has seen further excavation of the western recess, the south-west corner revealing some sort of structure filled with a sandy gravel which seems to be peculiar to that context. Removal of the baulks left to define the robber cut in Structure Twelve. There are a large number of what appear to be water-washed pebbles. The sandy gravel is a sharp contrast to the other levels I have worked on in the structure, which have consisted of a clay silt or dumps of clay and consequently much easier to work. This context has revealed few finds, apart from a beautiful worked flint. 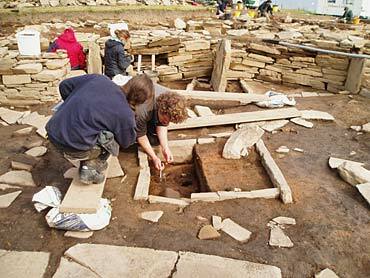 Other members of the Structure One team have been concerned with further excavating the second hearth, on the north-eastern side, and further painstaking cleaning and photographing of the main central hearth. This is my last day of what has been a wonderful opportunity to work on such an intact Neolithic site. My previous experience of early pre-Roman occupation has been limited to, at best, Iron Age sites with few, or no, preserved structures, other than ditches. Many thanks Nick and team for a wonderful opportunity – guess it’s back to the Romans for me . . .